Miller Roofing Contractors, a Conklin independent business owner, can help you with Conklin’s Metal Roof Restoration System. It is a complete waterproofing system for metal roofs. It stops leaks, inhibits rust, and provides an energy-efficient, long-lasting, attractive finish coat, which will extend the life of your roof for years to come. 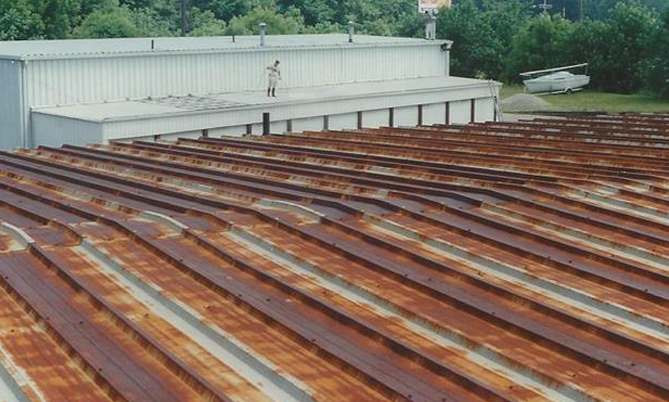 During the restoration process, the entire roof is cleaned with Rust Off and then primed with Conklin’s rust-inhibiting primer called Metal Ready Universal. Once the seams and fasteners have been reinforced, the entire roof is coated with a highly-reflective top coat. At Miller Roofing Contractors, we are more than happy to go over the metal roof restoration process and see if it would be a good choice for you. Offers top notch protection from Mother Nature.